Enda Lynn missed an injury time penalty as Derry's Division Three campaign started with a disappointing three point defeat against Westmeath in Celtic Park on Sunday. Derry had struggled following a blistering start from the visitors that brought two goals in the opening three minutes but had put themselves into a position to salvage something when Niall Toner was upended by Frank Boyle as he tried to latch on to a through ball. In the absence of the red carded James Kielt, Lynn took responsibility but his spot kick was too central and was turned away by Eoin Carberry to secure a precious two points for Colin Kelly's team. Whatever pre-match plans Derry manager Damian McErlain had laid out prior to throw-in, they were thrown into disarray by that Westmeath start few would have seen coming and which brought two goal inside the opening three minutes, the first after one one minute and 36 seconds! Callum McCormack was afforded far too much space inside the Derry danger area but it still took a superb Alan Stone pas to pick him out. However once he had he ball safely gather the corner forward fired a lovely low finish across Ben McKinless and into the bottom corner. James Kielt responded in typically long range fashion but within 60 seconds the ball was back in the Derry net although there was more than a touch of controversy about it as Galway referee James Molloy pointed to the spot for an off the ball tangle between Derry's Kevin Johnston and Westmeath full forward Luke Loughlin. Most eyes were watching Heslin's shot drop short at the time and it looked little more than what goes on every time there is a ball played forward in every game in the country but whatever the debate about the reward, Heslin was lethal with the kick and Westmeath led 2-01 to 0-01. Against the wind, the visitors couldn't have hoped for such a start but credit to Derry who responded with 1-2 without replay to bring themselves back into the game before 15 minutes had elapsed. The impressive Michael Bateson and Kielt pointed, the latter from a free, before McErlain's men produced a sublime move to grabbed the game's third goal. A flowing move looked to have been hit by traffic as it approached the posts but Niall Toner superbly picked out the marauding Niall Keenan with a brilliant low pass that took out the entire visiting defence. Keenan was clear but with Eoin Carberry off his line to close him down, the Castledawson back hand passed to Enda Lynn who had the easiest of tasks to find the empty net. That left it 1-3 to 2-01 with 15 minutes gone but Derry continued to have trouble with the elusive Heslin. He increased the visitors lead before Kieran Martin added another excellent score. Heslin was impressive but also lucky to escape what looked a text book black card for checking the run of Liam McGoldrick. Instead he was booked and it looked a costly decision as the St Lomen's men continued to plague the Oak Leafers. Emmett Bradley and Kilet brought the deficit back to 1-5 to 2-5 by the 28th minute but Westmeath continued to be dangerous on the break as the challenges flew in. McCormack and Ger Egan put the lead out to five but the home side responded again, Peter Hagan and Bateson ensuring that only that controversial penalty separated them at the break on a scoreline of 1-7 to 2-7. McCormack opened the second half scoring for Westmeath within 40 seconds of the restart but Brradley and McFaul hit back for Derry. The home side were trailing by one at 1-12 to 2-10 on 49 minutes when they received a boost as Westmeath's Sam Duncan was dismissed for striking out at Lynn off the ball. It called for composure from Derry but Heslin remained the most composed figure on the field and stretched the lead to two points with seconds of that red card, though Oak Leaf substitute Mark Lynch quickly brought it back to a one point game. McCormack and Lynch then swapped points but too often when Derry missed chances, Westmeath were perfectly placed to punish them at the far end as Heslin did when Lynch dropped a free short. It was a scenario which repeated itself time and again. Minutes later Lynch and Lynn put together a lovely move that forced Westmeath keeper Carberry into an excellent stop. a goal would have made it all square. Instead the bar was over the Derry bar seconds later as Loughlin pointed. Further points from Ronan O'Toole and Loughlin looked to have put the game to game at 1-13 to 2-16 but Niall Toner threw Derry a lifeline with a nice low finish through an crowded square to bring it back to 2-13 against 2-17. A Lynch free reduced the deficit still further before the drama of Lynn's penalty. 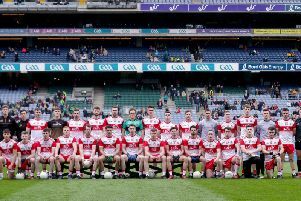 Derry: Ben McKinless; Niall Keenan, Kevin Johnston, Ruairi Mooney; Michael Bateson (0-2), Liam McGoldrick, Michael McEvoy; Conor McAtamney, Emmett Bradley (0-2, 1f); Enda Lynn (1-0), Peter Hagan (0-1), Ciaran McFaul (0-2); Danny Tallon (0-2, 2f), James Kielt (0-3, 1f), Niall Toner (1-0). Westmeath: Eoin Carberry; Mark McCallon, Killian Daly, Boidu Sayeh; Noel Mulligan, Sam Duncan, James Dolan; Alan Stone, Ronan O'Toole (0-1); Kieran Martin (0-1), John Heslin (1-7, 1pen, 4f), Ger Egan (0-1); Callum McCormack (1-4), Luke Loughlin (0-2), John Egan.